Need a College Degree to Work in Human Resources? Do You Need a College Degree to Work in Human Resources? Though you don't necessarily need a degree to work in Human Resources, not having a degree may limit you to lower level, less knowledge-based functions in your department. When HR Assistants come to work with a Bachelor's degree for $40-45,000, why would a forward thinking-office hire an employee without one? Overall, under most circumstances and for most jobs, a degree is secondary. Companies want candidates who want the person who is most prepared and qualified to do the best job for them. Some HR jobs, such as HR Administrators or as Payroll Specialists, that may not require a degree. Though you should recognize there may be a limit to how far you will be able to advance within your department. Some companies will not consider you for a promotion (or even look at your resume) if you don't have a degree, regardless of your experience. This is short-sighted on the part of companies. Four years of college does not make you more qualified than someone with 20 years of experience. Some companies are fighting the trend toward a college degree for everything. For example, some companies do blind hiring where candidates are evaluated based on an assigned task rather than their resume. Other companies are stating flat out that they will not require a degree for professional jobs. Increasingly, however, HR professionals have both Bachelor's degrees and Master's degrees. Since HR is a highly competitive field, the more education you have, in appropriate subjects, the better your chance for excellent job prospects, promotional opportunities, and a successful career. Some HR Directors have already obtained a Ph.D. and/or a Juris Doctor (J.D.) law degree. Because many HR responsibilities involve legal compliance, a strong understanding of the law is helpful. Usually, people in these positions started out as labor and employment lawyers and then moved into HR, rather than going straight from law school to HR. The increasing complexity of employment law, the large amounts of money awarded in lawsuits, and the sue anyone anytime for any amount attitudes that have developed, especially in the US, make law degrees for HR staff sought after and appreciated. Many long-term HR professionals argue that a degree is unnecessary, that they built a successful career up to and including positions as Vice President, without one. But, this is not the trend for jobs in HR. An HR professional, who wants to participate in the strategic leadership of a business, needs a degree. The degree is especially important in a strategic area. Why? Because if you want to be taken seriously by the senior management team, you need to speak on their level. This is not to say that you cannot do this without a degree, but you gain credibility by having one. Additionally, you have shared experiences with the management team. In a less degree-oriented culture and team, a degree may be less necessary. The type of degree you have for a job in HR can vary. There are HR employees with degrees in Political Science, Business, Social Work, Elementary Education, IT, and other non-HR degree areas. Many employees have Master's Degrees in HR, with bachelor's degrees were in different subjects. HR is a much more popular degree, and much more available, than it was 20 years ago. Moving into the future, more people with a focused degree in HR or business management will be present in the field. The reason people with varied degrees thrive in HR is that HR functions are so varied. In the above example, the political scientist had a strong background in data analysis. The social worker could handle employee relations issues with ease. Your imagination can run wild on why someone with a degree in elementary education was valued in an HR department. But, training and development departments and functions have increasingly sought educational credentials as the career development field has expanded. Another path to HR is to work in another field and then transfer to an HR function supporting people in this field. This is especially valuable in recruiting (they truly understand job requirements) and HR business partner roles. But, people from many other jobs have switched successfully to a career in HR. HR people who took this path often have a wide variety of degrees as well. They bring a wide variety of knowledge to the HR office that is appreciated. The answer is all over the board depending on your circumstances, what you want to do, and what your targeted organization needs, wants, and expects. But, the bottom line is that HR professionals increasingly have Bachelor's degrees and advanced degrees. Why not consider joining the best prepared, degreed professionals? How Do I Pursue a Career in HR? Want to Know the Most Popular Topics in the Human Resources Content? What Is Human Resource Development (HRD) in the Workplace? 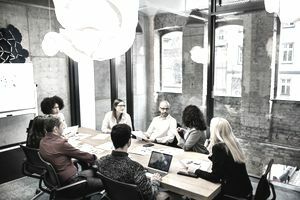 What Tech Does Your HR Department Really Need?